Today an update has gone out to the somewhat-neglected Eamon Dunphy soundboard android app. Get it now from the Play store! 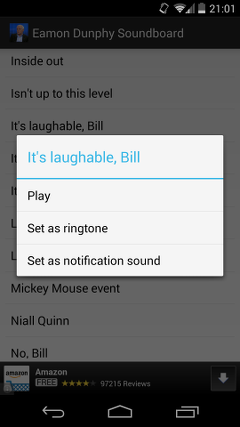 This update adds a series of new quotes, fixes some bugs around ad rendering, and allows memorable Dunphy quotes like “Are you going to let me talk?” or “It’s laughable, Bill” to be easily set as a ringtone or notification sound. It’s also a fully-native android app. The previous soundboard app was done in 2010 as a phonegap port of the Eamon Dunphy Soundboard website I set up. When I first set the website up, it stumbled it’s way in to the Guardian Football list of “Interesting things this week”, which caused it be briefly very popular. I had quite a few people sending me quotes for inclusion, as well as asking for an app version. I knew html and css but didn’t know enough Java to make an android app, so a phonegap app was the path of least resistance. It had the usual issues with phonegap-type apps, but as a toy side project was not something I was too worried about. As android versions moved on, the app slowly fell apart and ceased to work. I was looking for an opportunity to dip my toes in to android development with Android Studio and judging by the download charts, soundboard apps seem to be about as close to “hello world” as you can get! So I took this as an opportunity to update the soundboard app, and this update was born!